My guess would be too hot, melted fat, and no cooling bath. I think his first mistake was that he didn't stuff the casing tightly. When he was here I had him start to stuff a casing and it was really loose so I stopped him and showed him that those fibrous casings will allow a lot of pressure so he needed to stuff them very tightly. When he started again, he indeed stuff them really tight and at the end of the day was very pleased with how they came out. While the meat was still pretty moist I do think that his temp was way too high. This along with the loose packing resulted in all kinds of fat deposits all over the outside of the sausage as you peeled the casing back. 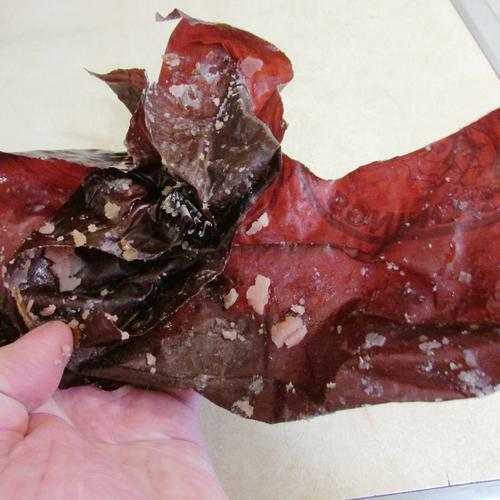 While still edible it just makes the product looking less than desirable. It's winter here but I've told my friend that using the 5 gal food grade plastic bucket that I gave him along with ice and some water would do wonders but again he's failed to log that info into his memory. Oh well, at least he's making sausages! spazola and Dieseld like this. 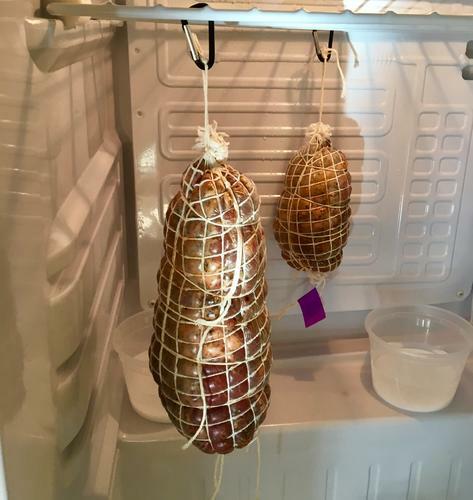 This was my first attempt at dry curing a coppa. It was a small one since the shoulder I took it from didn’t have all of it intact. Here are my observations. First, there is case hardening. I’ve vac packed it and will see if it improves in a week or two. I had a fan that was blowing on it too much in the early part of the drying process. Second, 40% weight loss is a MINIMUM. Anything less is not going to be good. This has 40% loss and it still seems a bit wet for my taste. Next time I will push it further. The curing part I paid close attention to. The spices I was more liberal about. 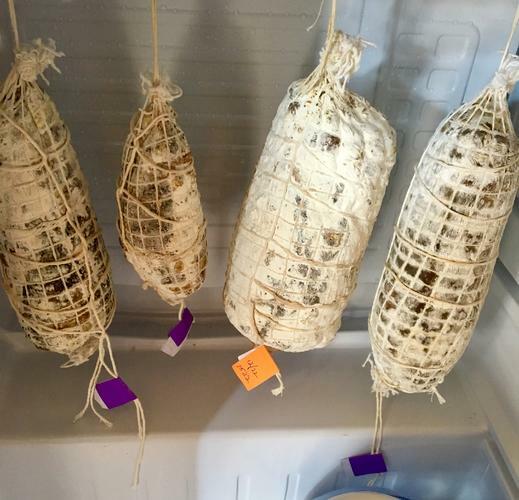 After the initial curing of about ten days, I rinsed it clean with water then wine. I then applied a mix of approximately 3 parts ground long pepper, 2 parts ground fennel seeds, 2 parts paprika, and a pinch of cayenne. The spices didn’t get layered on really heavily. A nice coating but not a crust. I wrapped this in collagen sheets and netting. The curing was 2% salt, .25% IC2, 1% brown sugar, and .5% black pepper. spazola, cudarunner, eddy79 and 3 others like this. First of all, this stuff isn’t easy. I like to think that it has a lot of similarities with pastry making. You have to be precise, you have to be really organized, and you have a series of steps that all must go perfectly for it to turn out. I personally dislike fibrous casings for this reason. They don’t constrict the way a natural casing does. A natural casing seems to constrict and force excess moisture and fat out. Once meat hits 150 degrees tha proteins begin forcing out moisture. It seems that there will always be some of this in the absence of a binder. Cooking it too hard only makes it worse though. Last edited by OCDshaver; 02-10-2019 at 05:34 PM. spazola, cudarunner, 32t and 1 others like this. 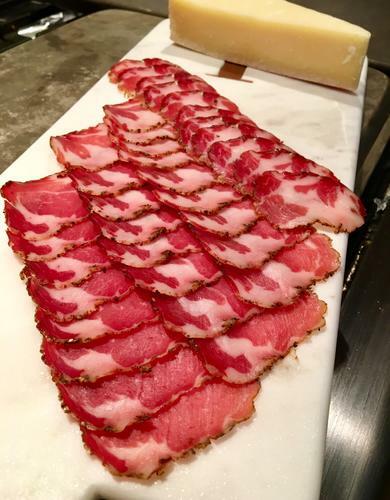 When I make my smoked kielbasa I use large hog casings/usually around 32- 36mm and once stuffed I use a needle to poke any air pockets as if you don;t they can allow fat to collect. I've played with the collagen casings but I don't really like them. With that said if used properly they have their place. The sausage my friend made is from a kit and it includes the fibrous casing. I've been tempted to order some beef middles and try them using the spice mix just to see what happens. When we made them here, it took about 10 hours to get the internal temp up to 165-then showering them until they were about 80-90 degs before bringing inside to hang to dry--Low and Slow is the Way to Go. He was so pleased with how they came out, the casings weren't shriveled, there wasn't any fat between the sausage and the casings and they were a nice moisture level. But he showed up the next day with a batch he'd just made, said they were done in about 4 hours and they were shriveled and full of fat on the outside. So I do think that my friend will continue not stuffing tightly enough and using too high of heat. I think it's part of what he battles with. I'm not sure but for some reason Bi Polar comes to mind. I know it wasn't until after he had two kids and his wife divorced him (out of the clear blue sky--papers were served to him at work 4 days before Christmas) that he was diagnosed with whatever it is that ails him. All and all he's a great guy, it just that at times he's compulsive about things. I have issues with curing/aging/decomposing/rotting or how ever you call it, meat on purpose. These types of thing came about when they had no choice on how to store their food like refrigeration. I am not a cleanliness freak and think that things introduced into your body slowly build up resistance that with our radiated etc. food source now a days doesn't is not necessarily bad. I know people with bi polar. But I’m not qualified to diagnose anything either. But his condition may not have anything to do with sausage making. He might simply not get it or maybe his smoker is such that regulating heat is all but impossible. When I got a Bradley I was finally able to regulate heat. My other smokers were esssentially bbq units. They were good for ribs but not good for sausage. And I certainly couldn’t cold smoke in it. Back to the fibrous casings. I used them a few months ago to make some cooked sausage. They were tight and full. I poked a thousand holes in each of them to allow moisture to escape. 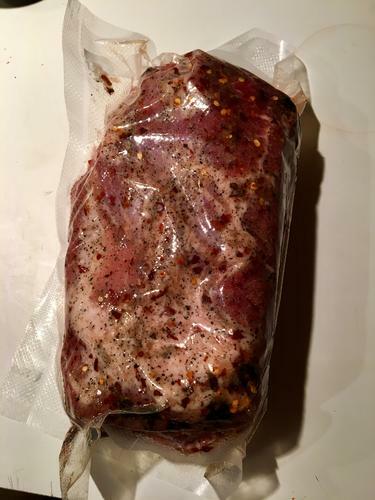 I then cooked the sous vide at a very gentle temperature. Same thing. Upon cooling they had a nice porky jelly inside the casing. The casing was coming off anyway so it didn’t affect the outcome much. But not exactly appealing either. I may even use up what I have. But I certainly won’t buy them again. An emulsifier might help but beef middle would too. I’ll go with the beef middle. Your tastes are what they are. There’s no point arguing matters of taste. But curing is not decomposing or rotting. It’s quite the opposite. I shouldn't have included curing. 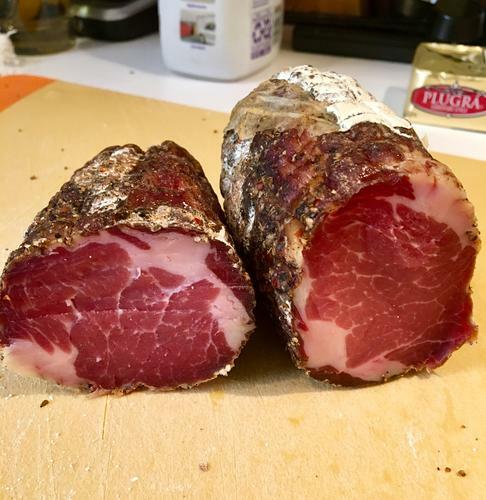 I got to slice up some of the coppa from the other day. Tasty. spazola, cudarunner, 32t and 2 others like this.